Here is a great opportunity for you and your family to have a fantastic holiday in Spain at an incredible price! Heritage Resorts and Hotels are pleased to offer you the chance to sample a weeks accommodation and experience the quality and hospitality that has made us so successful for over 30 years. This offer is open all year round and is not to be missed! Don't delay book today by simply filling in the form below. Prices range from as little as £129 for the whole family for the week! 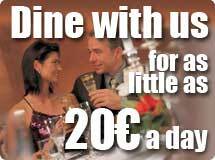 In addition we can offer half board packages from €25 per person per day so you can truly relax and leave the cooking to us! Car rental,excursions and pamper packages can also be arranged. Once you have submitted the form our reservations team will contact you to co-ordinate your dream holiday! Fields marked with an asterix (*) are required.